Gypsy Roller's Veggie Kitchen | Delicious meatless recipes straight from my kitchen in the Fraser Valley, British Columbia! 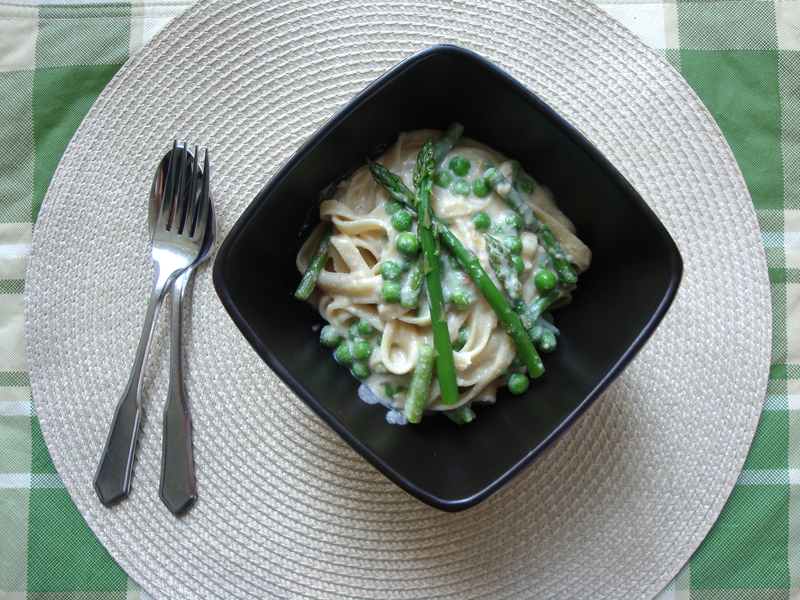 Delicious meatless recipes straight from my kitchen in the Fraser Valley, British Columbia! As a youngster in the 1980s – like most kids then and now – I’d base my opinion of a restaurant almost exclusively on the way in which the food was packaged, and of equal importance, on the swag that accompanied the meal. This meant that fast food chains ranked very high in my list of top dining establishments, namely McDonald’s with it Happy Meals (anyone remember those highly-coveted Muppet Babies figurines?) and Burger King with its 3 packs of mini hamburgers aka ‘Burger Bundles’, which for all their frivolity were likely the prequel to the now omnipresent ‘slider’. I don’t recall particularly enjoying the food at these places; I was sold on them for the toys and whimsically-presented meals alone. Back then I hadn’t yet acquired an awareness of the marketing tactics of fast food chains, hell bent as they are on getting kids addicted to bad-for-you foods via an assortment of crafty ploys, from gimmicky packaging and tie-ins to the latest TV show or blockbuster movie, to on-site ‘play places’ where kids can work off their soda-induced sugar highs. The guile and cunning of these companies really is extraordinary; I wouldn’t be at all surprised to find out their marketing team include someone with a degree in child psychology – someone with the know-how to exploit the addictive potential of their young customers’ developing psyches! Despite the cynicism I’ve acquired in adulthood about pretty much every aspect of fast food, I still recall with real fondness the experience of my parents taking me to eat at White Spot, a chain of burger joints exclusive to Western Canada. When I was little, White Spot earned my intense affection for its kids meal called the Pirate Pak, tantalizingly served in a cardboard schooner, complete with a sail impaled on a straw and best of all, a gold foil covered chocolate dubloon. 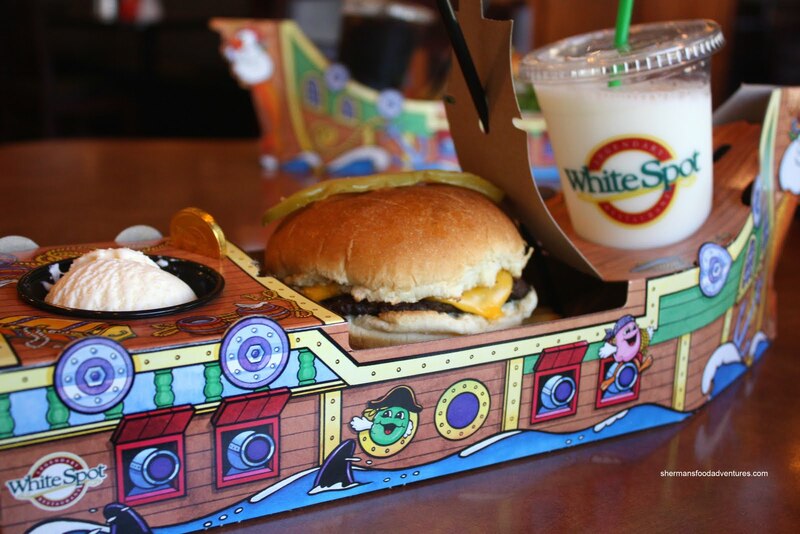 Sure, the Pirate Pak was White Spot’s own little ruse to entice children to eat at their restaurants, but you have to admit it’s a pretty cool concept, and refreshingly void of any sort of corporate tie-in. While in recent years White Spot has ditched its soda jerk vibe and morphed into a somewhat generic family restaurant, I still eat there regularly – if not for the atmosphere then for the delicious provolone-portobello veggie burger and cheap pints of Nat Bailey Pale Ale. Their brunches are also the best in town (I even requested to be taken their this past Mother’s Day). The smashed potatoes in this post (which are basically potatoes which have been boiled, flattened slightly, then pan-fried until crispy in a skillet) are my attempt to emulate the ones that are served alongside practically every item on the White Spot brunch menu. 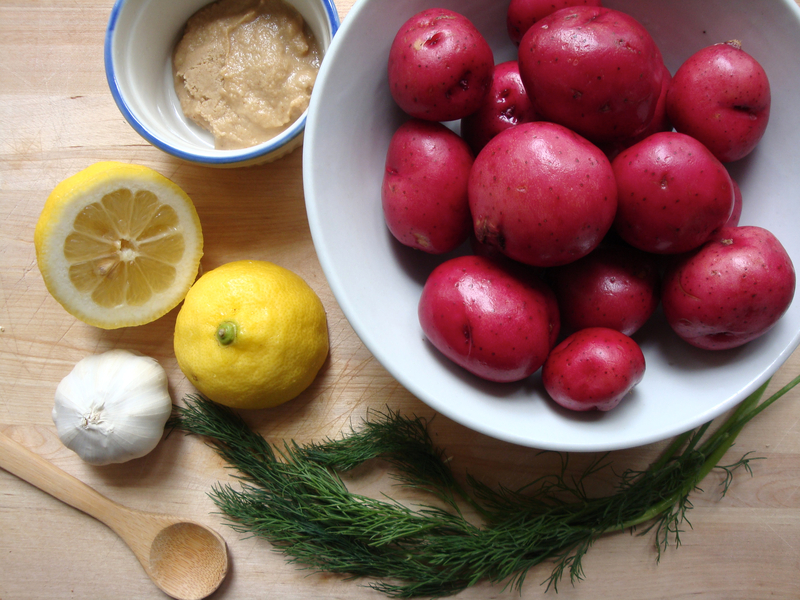 Place potatoes in a large stock pot and cover with water. Bring pot to a boil, then reduce to a simmer. 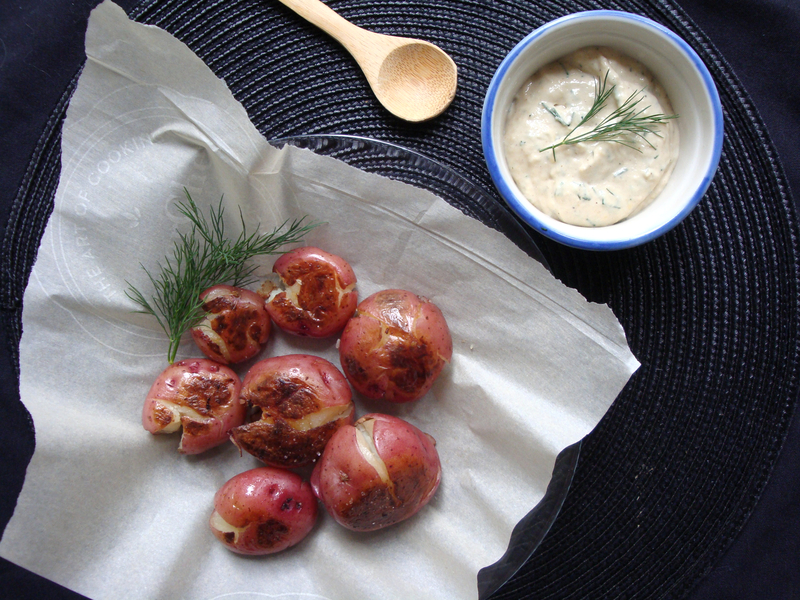 Let potatoes cook until tender all the way through, about 15-20 minutes. While potatoes are cooking, preheat oven to 425F. Peel outmost layers of skin from garlic bulb. Place garlic on an approx. 6″ x 6″ piece of aluminum foil and drizzle with 1 tablespoon of olive oil. Season lightly with salt and pepper. Bundle aluminum foil tightly around garlic. 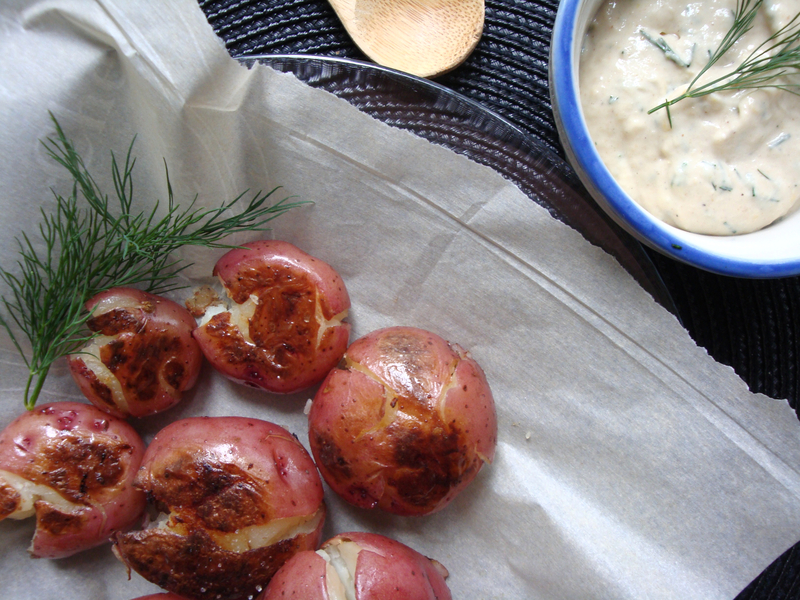 Place in oven and roast until garlic cloves are soft, about 30 minutes. Once garlic has cooled enough to handle, carefully remove skin from each clove (the clove should separate easily from the skin). Place garlic cloves in food processor along with tahini, vegan mayonaise, lemon zest and juice. Taste mixture and season to taste with salt and pepper. Transfer mixture to small bowl and stir in minced dill. Cover and store in fridge until needed. Once potatoes are cool enough to handle, flatten each one slightly. Do this by holding potato between your index finger and thumb of one hand and pressingly down gently with the heel of your other hand. Don’t press too hard or your potato will fall apart! After flattening each potato, heat one tablespoon of olive oil in a large skillet over medium heat. Once oil is hot, transfer your flattened potatoes to the skillet. Season lightly with salt and pepper. Pan fry potatoes until crispy, about 3-4 minutes on each side. 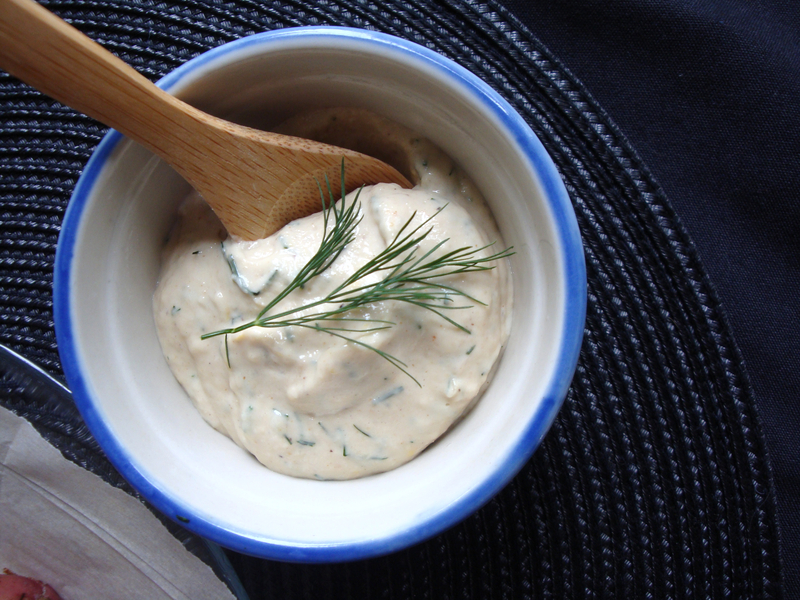 Remove from heat and serve, topping each portion with a dollop or two of Creamy Lemon-Dill Tahini Sauce. Eat! Parents make a fairly accurate claim when they say that having a kid is one of the hardest things you’ll ever do. I’m not even talking about the pushing-the-baby-0ut part – although I still stand by my assertion that being in labour feels (in my experience) like being hit repeatedly in the abdomen (and back) with a sledge hammer. The real work comes with figuring out just how to handle the darned thing once he or she pops out as a fully-formed infant. I used to roll eyes derisively behind my Ray-Bans when a parent would bemoan to me their toddler-induced exhaustion. But now that I have a toddler of my own I know only too well what they’re talking about: the non-stop night nursing, the refusal to eat certain foods (and the subsequent hurtling of said foods across the room or in the direction of the dog), the panic-inducing (for me) thrill seeking (my little guy loves to scale to the highest heights unassisted), the obsessive manhandling of only the filthiest household items (plunger and toilet brush), the seemingly unprovoked, back-arching tantrums. I could go on and on. I love the little sucker to bits and am growing more obsessed by the day – I even look at pictures of him on my phone while he’s napping – but HOLY COW does he put me through the paces at every conceivable moment! At a certain point one gets to thinking about taking a bit of a vacay, especially on days like today when the dog woke you up at 2am in the throes of diarrhea. Oh wait, except as a parent of a young child a true vacation – one where you can kick back with your oversized cocktail of choice and not have to worry about the proximity of your kid to the pool, and other potentially life-threatening considerations – isn’t really an option. Neither is leaving him with the in-laws, because as burned out as I feel at times the thought of not being around him for even a few days puts a very large and sappy tear in my eye. At any rate, we’ve decided to attend a friend’s wedding in Puerto Vallarta – although it’s not until November and I’m sure I’ll spend 99 percent of my time there chasing the little guy around with a tube of sun screen and worrying about the possibility of shark attacks, kidnappings and other statistically improbably occurrences. Being a parent has transformed me into the ultimate worry wart! While our sojourn to Mexico is still 6 months away (will I still be sane by then? ), as soon as I was finished booking our seats with the travel agent my mind reverted to its favourite topic: food. And in this instance, Mexican food. My favourite item of Mexican cuisine, apart from a big old Mission-style burrito cram packed with fresh veggies, is also the most simple: fresh cut salsa paired with crispy tortilla chips (and an ice cold bottle of Sol, of course). Place lime juice and salt in a medium bowl and whisk to combine. 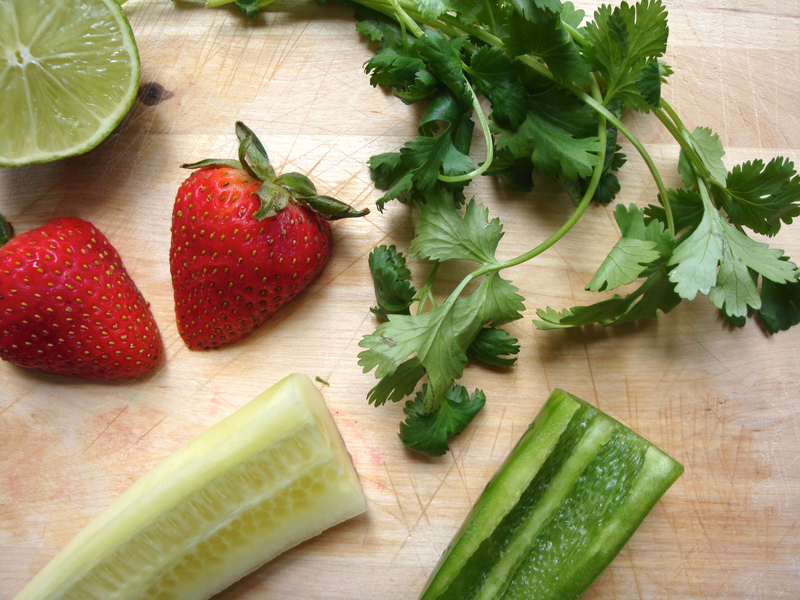 Add cucumber, strawberries, cilantro, jalapeno and shallot to bowl and gently toss until everything is combined. Cover bowl and place in refrigerator until needed. Lightly grease an 8×8 pan with olive oil and set aside. Place almond milk in a medium saucepan and bring to a gentle simmer. Whisk in cornmeal then switch to a spoon as mixture thickens. Stir until liquid is fully absorbed. Remove from heat and stir in margarine and nutritional yeast (or parmesan), and a bit of salt and pepper. Immediately transfer polenta to prepared pan and smooth top with a wet spatula. Place in refrigerator for 45 minutes, or until firm. While polenta is in fridge lightly grease a baking sheet with olive oil. Once polenta is firm, remove from fridge and preheat oven to 375F. 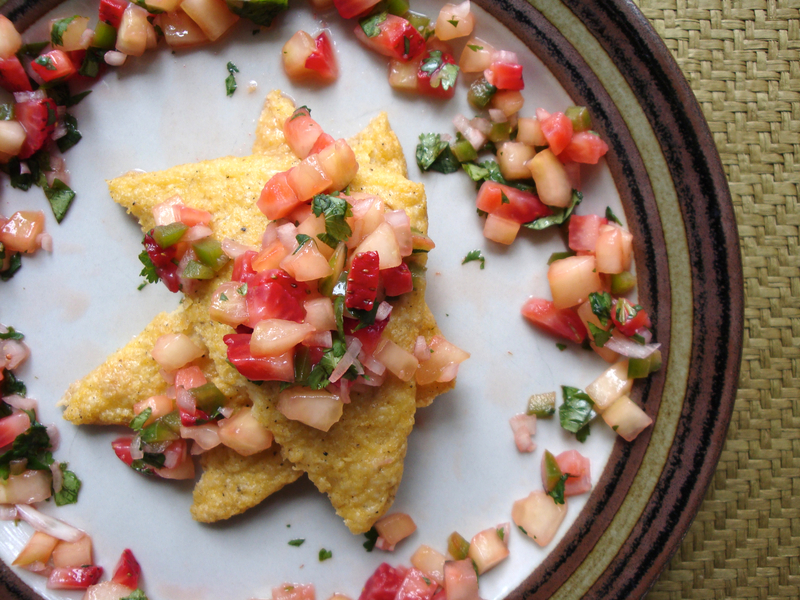 Flip polenta onto a cutting board and cut into wedges. 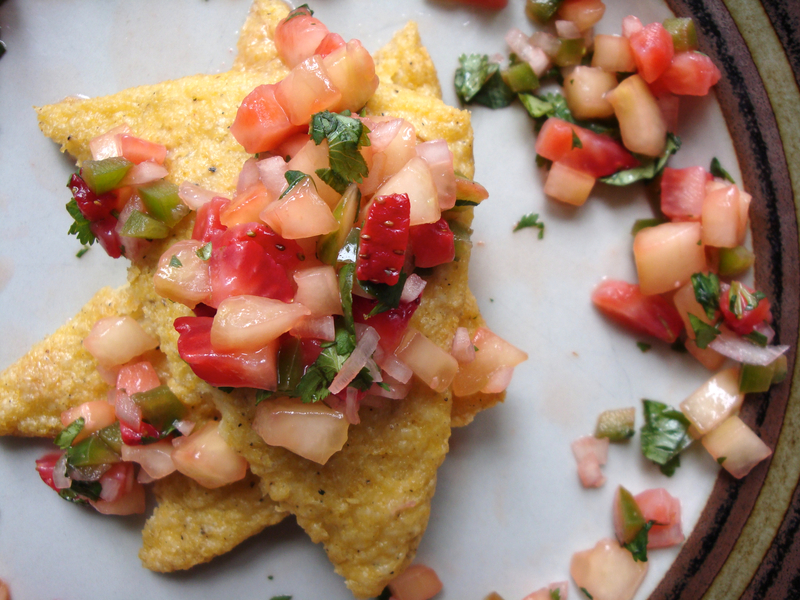 Transfer polenta wedges onto prepared baking sheet and brush tops with a bit of olive oil. Place in oven for 45 minutes or until tops are crispy and golden brown. 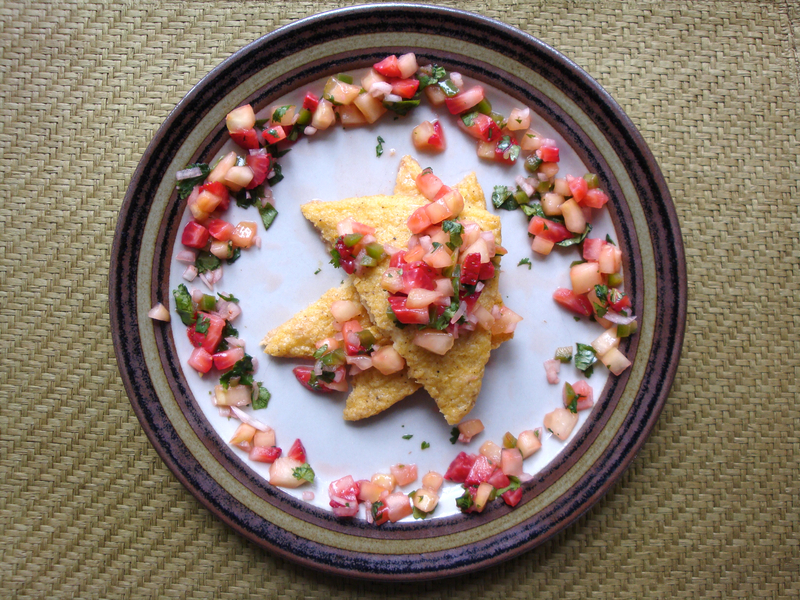 Transfer polenta wedges to serving plates and top each portion with a few scoops of salsa. Eat! For those of you who participated in Virtual Vegan Potluck this past Saturday, I hope you enjoyed it as much as I did. The scope of recipes that was brought to the table was remarkable, as was the care and expertise with which each dish was presented. I was really inspired by how creative – and in many cases, outright gourmet – the dishes were, flying in the face of any negative stereotype of ‘vegan potluck food’ one might hold. 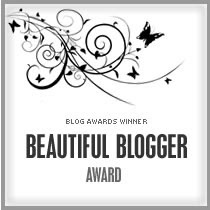 Vegan bloggers are clearly a talented lot! If you’re interested in checking out the potluck from the beginning, you can do so here. I also was super impressed by how smoothly the potlcuk came together – although I’m sure Annie at An Unrefined Vegan and Somer at Vedged Out, who coordinate the event, would disagree; just a guess, but rounding up 160+ bloggers from around the world and figuring out the logistics of getting them to post in unison must be a bit of migraine headache. I admire her dedication to making the whole thing happen! My sweet tooth was given full expression with the Salted Triple Chocolate Brownies I made for the potluck. Maybe the best thing about vegan baking is that you can sneak spoonfuls of the batter without risking salmonella poisoning, something I fully took advantage of while I was making my brownies. By the time I’d finished photographing and then sampling the final product, I felt like I’d definitely reached my sugar quota for the week, maybe even the month! Whenever that happens – and it certainly wasn’t the first time – I feel the need to ‘undo the damage’ wrought by the demonic baked good in question via a super healthy concoction of some sort. … Which is where this salad comes into the picture. 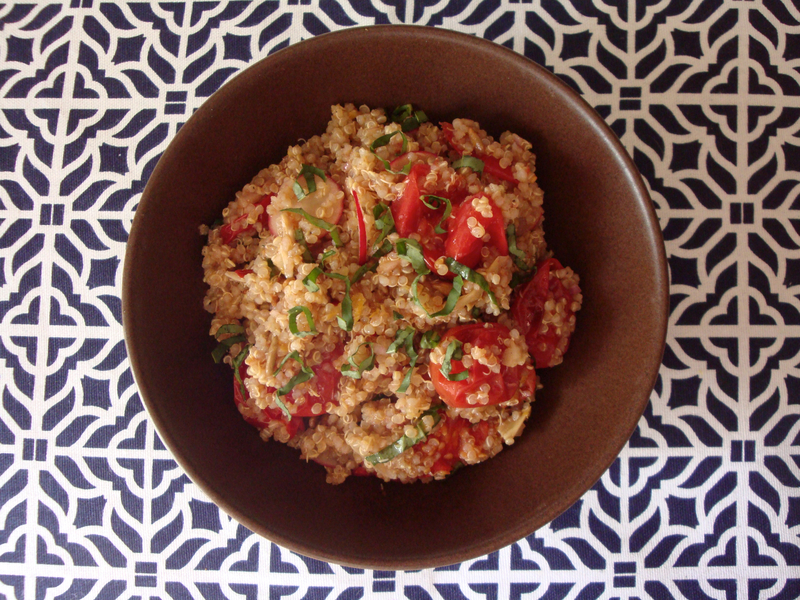 Being a quinoa salad, it’s inherently nutritious – but with the bold flavours of marinated artichoke hearts, sweet balsamic-roasted cherry tomatoes, fresh basil, lemon zest and crunchy radishes and toasted sunflower seeds, it’s anything but rabbit food! It makes a satisfying lunch on its own, and is also great as a side dish – but maybe the best way to enjoy this salad – and I only discovered this with the leftovers – is to bundle it up in a wrap and eat it that way. I guess I shouldn’t be surprised – bread of any description always takes things to the next level! Rem0ve from oven and set aside to cool. 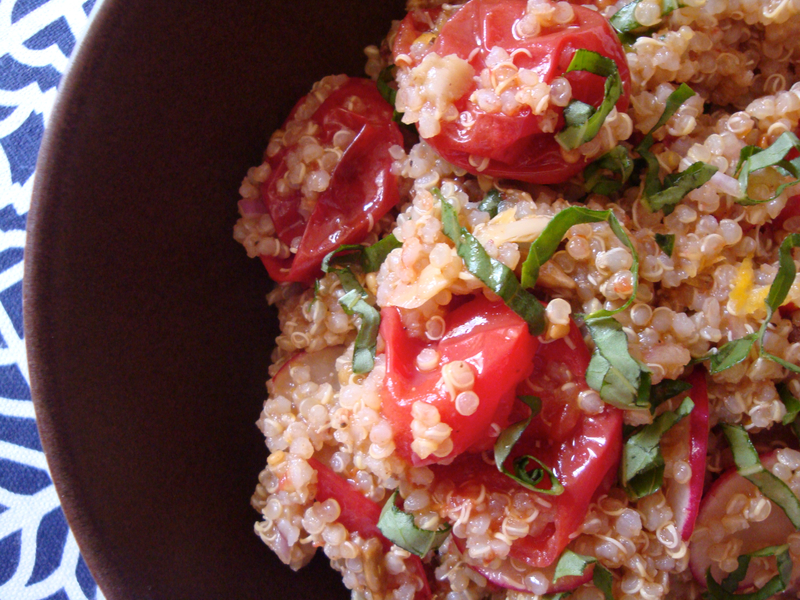 While tomatoes are roasting, combine rinsed quinoa and 1 1/2 cups of water in a medium saucepan. 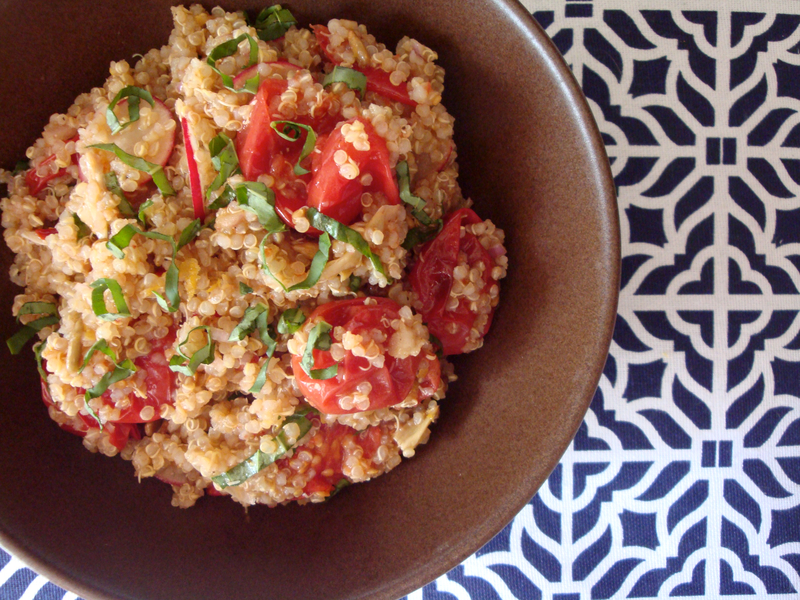 Reduce heat to low and let quinoa cook for 15 minutes. Remove from heat, fluff with a fork and set aside to cool. Combine olive oil, lemon juice, red pepper flakes, coriander and salt in a small bowl and whisk everything until thoroughly combined. Place sunflower seeds in a small skillet over medium heat. Tossing continuously, toast seeds until just golden brown (this will only take a couple minutes – be careful, they burn easily!). Place cooled quinoa, shallots, artichokes, radishes, basil, lemon zest and toasted sunflower seeds in a large salad bowl and toss to combine. 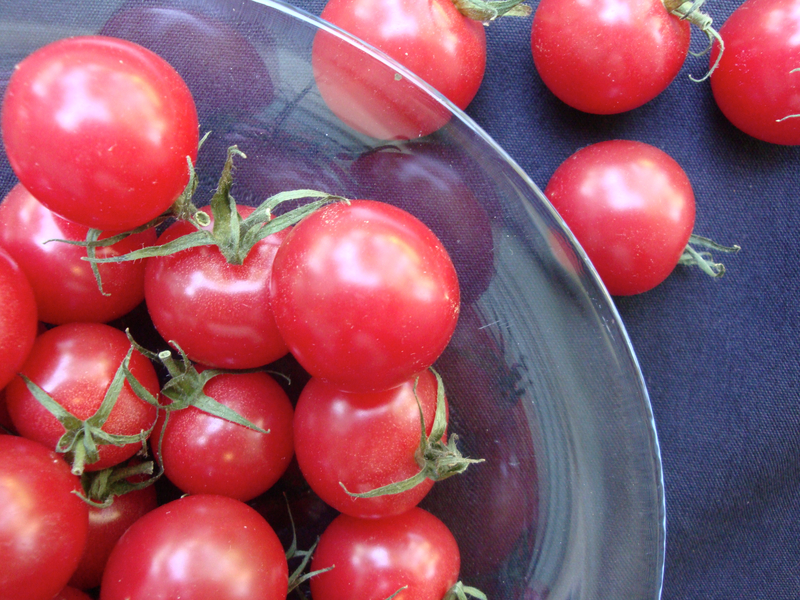 Gently fold in roasted tomatoes and juices from roasting pan. Drizzle lemon vinaigrette into bowl toss until everything is combined. Serve, topping each portion with freshly ground black pepper. Eat! 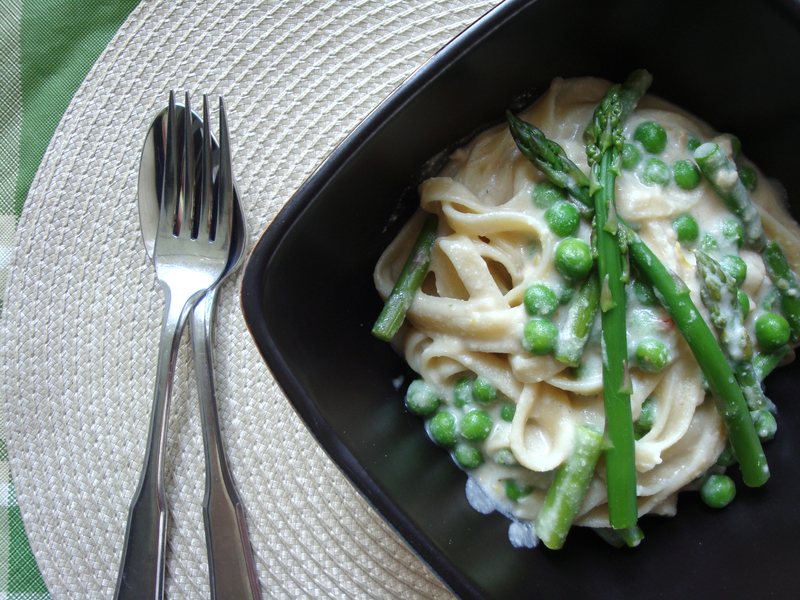 Welcome to the May 2013 edition of Virtual Vegan Potluck! This is my first time participating in the potluck and I’m pretty stoked to be joining forces with 168 other bloggers to create the ULTIMATE vegan three course meal! 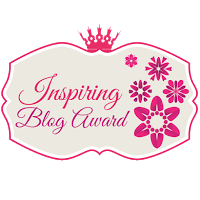 If you don’t know what the heck I’m talking about, click on the icon above and find out more. Just don’t forget to come back! Hi again. If you’ve followed the potluck from the start, excellent work. Your virtual stomach must be getting full, but I hope you have a bit of room left for another dessert! Those of you who read my blog regularly already know I have a crazy sweet tooth, and have been known to go a little overboard in the bulk candy aisle at the grocery store from time to time. While I’ve been trying to scale back my sugar consumption recently, I figured it would be OK to make an exception – this being my Virtual Vegan Potluck and all. So in honour of the occasion I whipped up a batch of these moist, uber decadent Salted Triple Chocolate Rhubarb Brownies! 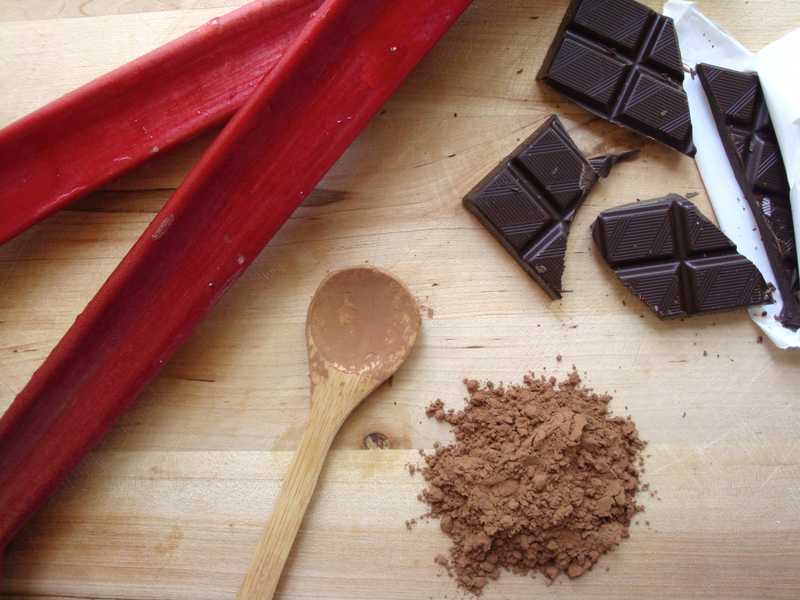 At this point some of you might be thinking only a crazy person would combine chocolate and rhubarb. But don’t call the asylum quite yet! Somehow the tangy punch of rhubarb marries blissfully with the richness of dark chocolate – and despite the 50 percent divorce rate, this couple is together for the long term. Ok, that was a super corny… just believe me, it’s a flavour combination that works. Rhubarb is coming into season in this part of the world, and whether you’re fan of it or not, I can almost guarantee you’ll love these brownies! 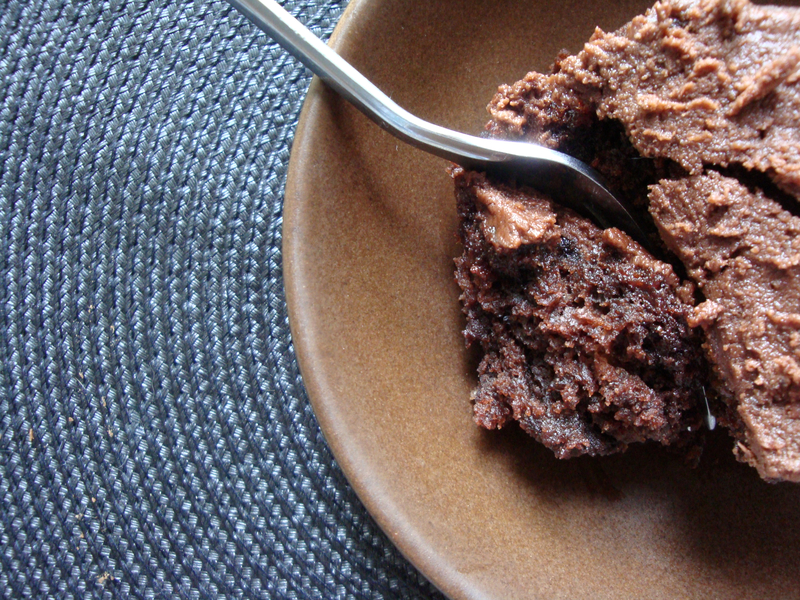 As an added bonus they’re a one-bowl affair, so you can have a clean kitchen and eat your brownies, too. And oh yeah, they taste even better the next day (if they last that long). Preheat oven to 350F. Grease an 8 x 11 pan and set aside. In a large bowl mix together flour, sugar, coconut oil, apple sauce and vanilla. Add cocoa powder, salt and baking powder and mix on low just until everything is combined. Gently fold in rhubarb and chocolate chunks. Pour batter into prepared pan and bake for 25-30 minutes, or until toothpick comes out clean. Remove from oven and set aside to cool on a wire rack. In the same bowl you used for the batter (or use a clean one – just trying to save you some work) cream together margarine and vanilla. Blend in cocoa powder and salt. Blend in powdered sugar one cup at a time, beating well after each addition. Beat in almond milk and continue beating until frosting is light and fluffy. [If you find the frosting too dry, add a bit more almond milk. If it’s too soft, add more powdered sugar]. Cover and set aside until you’re ready to frost brownies. 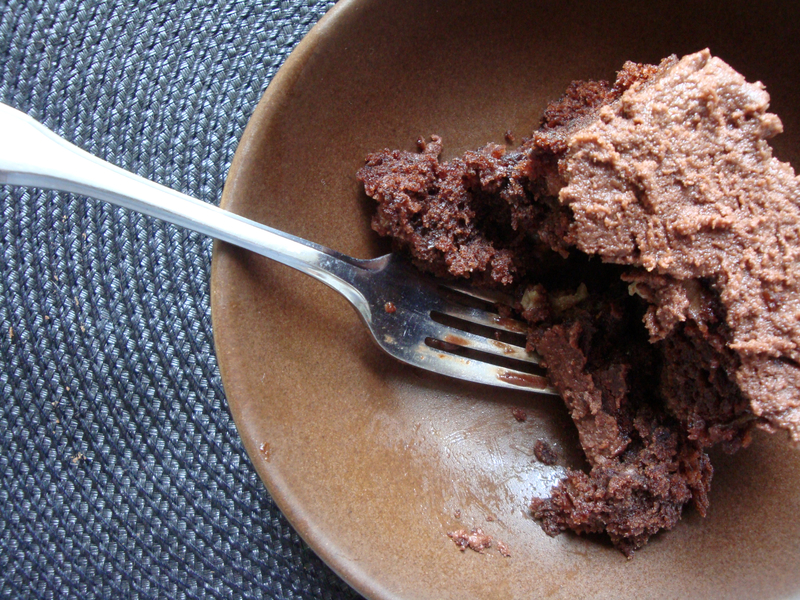 Using a frosting knife or spatula, frost top of brownies. Sprinkle a bit of sea salt on top of frosting. Cut into squares and serve. Eat! I’ve admitted here before that for most of my life I’ve had a rather self-righteous disdain for the suburbs. When I lived downtown, before I had a baby, an unflattering stereotype of the suburbs existed in my brain: subdivision upon sprawling subdivision, bumper to bumper mini vans, Lulu Lemon-clad soccer moms with the carefully cultivated Kate Gosselin hairdos. It was the Big Box stores that bothered me the most, you know the ones – the Home Depots, the Bed Bath and Beyonds, the Best Buys, the chain restaurants. All suburbs seem homogenous in this regard – compare one around where I live to one in Ontario or to one in the American Midwest and you’ll likely see a nearly identical cross section of venues to spend your money. Despite the anti-suburbanite rancour of my pre-baby self, I’m now a suburban dweller – albeit a reluctant one. Now that I live here, most like for the long run, I’m trying to adopt what could be described in a when in Rome attitude toward the Big Box attractions in my neighbourhood. I’m not going anywhere, and neither are they, so we might as well try to get along, right? To this end, we dined at Olive Garden – the only one in BC, quite the distinction – last weekend. It’s situated in a strip mall, of course! When you eat at Olive Garden you don’t just get a meal – you get an experience. I’m talking hovering hordes of psychotically charismatic servers, basketfuls of free bread sticks, free wine samples, and bottomless soup and salad. Crazy! There was so much food, drink and general mirth being thrust in our direction as soon that I could hardly focus on making a selection from the menu. And the place was fully bumping – we had to wait 45 minutes for a table; every inch of the restaurant’s thousands of square feet was packed with diners munching their way to Tuscan-style chain restaurant heaven. I ended up ordering a porcini mushroom ravioli, which was surprisingly delicious and far from the bland, coagulated muck I expected it to be. For dessert, a large slab of Tiramisu – also tasty! 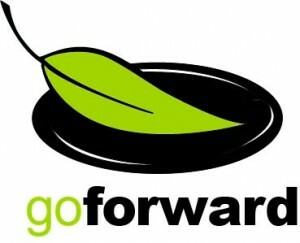 Hey, Virtual Vegan Potluck is coming up on May 11! Are any of you participating? If so, what type of dish are you bringing? I’m bringing a dessert and am VERY excited about my recipe! Prepare flax egg according to this recipe – this needs to be done 1 hour in advance. 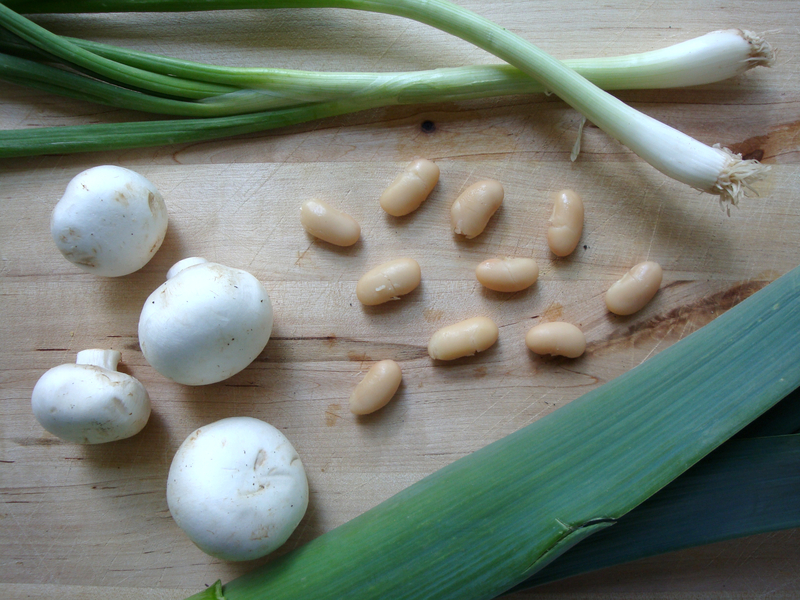 Place drained cannellini beans in a large bowl and mash using a fork or potato masher. Set aside until needed. Heat 2 tablespoons of extra virgin olive oil in a medium skillet over medium heat. Add leeks and saute until tender. Add garlic and saute just until golden brown. Add red pepper flakes, paprika and coriander and stir until spices coat other ingredients. Add mushrooms. Season lightly with salt and pepper. Cover skillet and let mushrooms reduce, stirring periodically. Remove from heat and transfer contents of skillet to your bowl with mashed cannellini beans. Add flax egg and bread crumbs and season lightly with salt and pepper. Stir until everything is well combined. I started with a wooden spoon then used my hands once mixture was cool enough. Using a 1 tablespoon scoop, roll mixture into balls and place on a plate. Tip: Keep your hands damp to prevent mixture from sticking. Place in fridge for 45-60 minutes to chill. 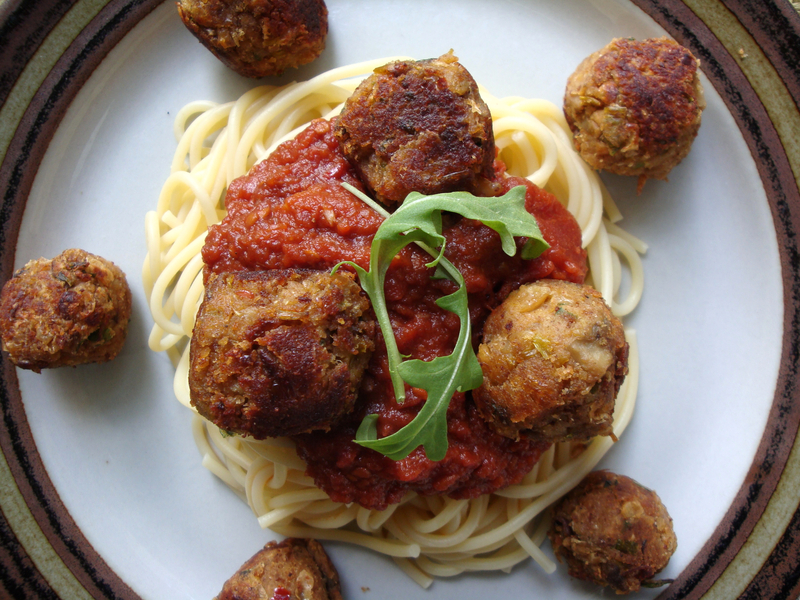 Next you’ll brown your meatballs (do this in two batches to make it more manageable). Heat 1 tablespoon of olive oil in a medium skillet over medium heat. Once oil is hot, add half of meatballs to skillet. 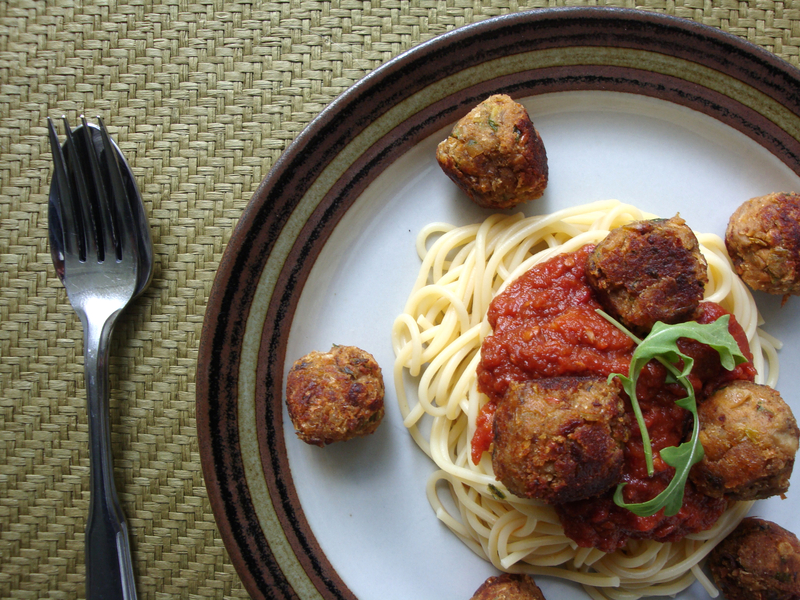 Using a wooden spoon, keep meatballs moving until each side is golden brown. Repeat steps 13-15 with second half of meatballs. Keep meatballs warm in oven until ready to serve. Add red pepper flakes, oregano and thyme and stir until spices coat garlic. Add diced tomatos and bring to a gentle boil. Reduce heat to low and let simmer for 15 minutes, stirring occasionally. Using an immersion blender, puree sauce until mostly smooth (I like to leave a few tomato chunks). You can also use a conventional blender, then return sauce to skillet. Keep simmering sauce on low until ready to serve. Add a little water if sauce becomes too thick. Cook pasta according to package instructions, or until al dente. Transfer cooked pasta to skillet containing tomato sauce and toss to combine. 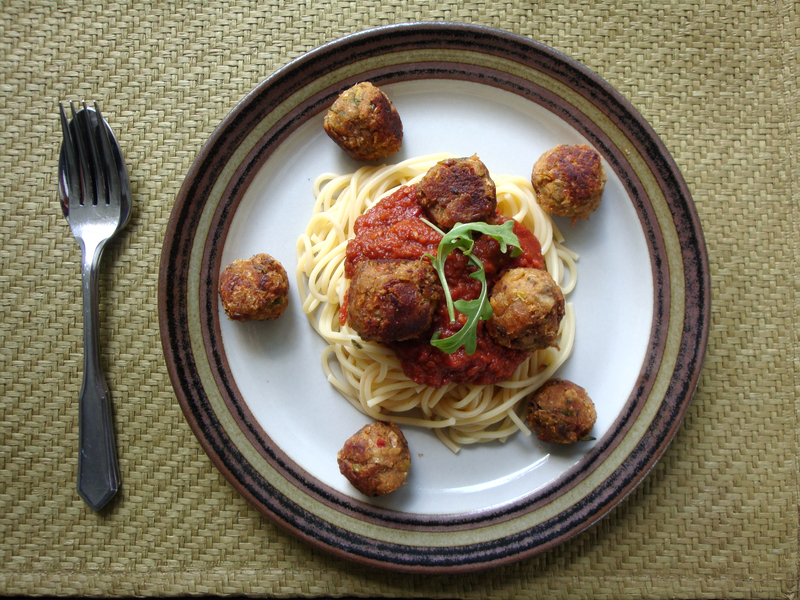 Serve, topping each portion with meatballs and freshly ground black pepper. 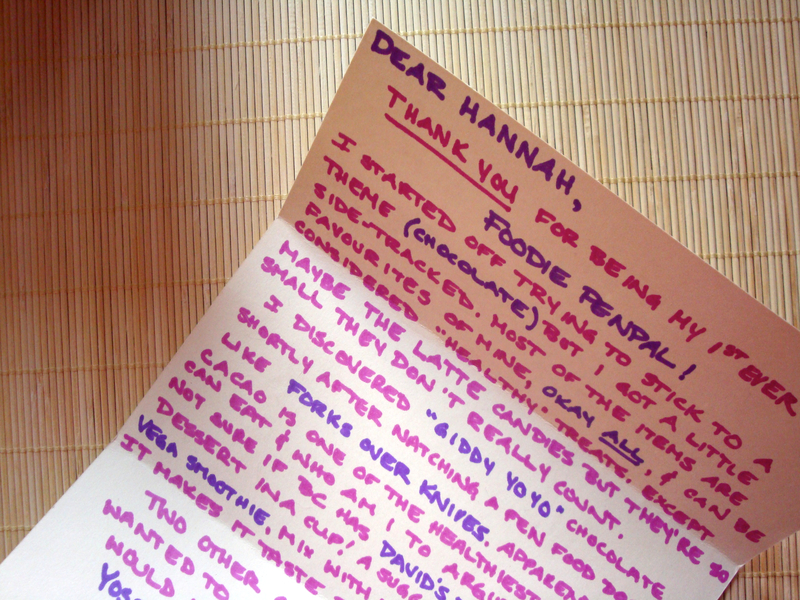 For months now I’ve been experiencing Foodie Penpals vicariously through a few of the blogs I follow. On each reveal day I’d read keenly through posts detailing the tasty foodstuffs participants had received from their penpals, and would be itching to get in on the action. Finally I decided to quit observing from the sidelines and sign up for the program! If you’re not already aware, basically how Food Penpals works is as follows: You’re paired up with two people. One of these people you send a package of foodie things (snacks, treats, etc.) to, and the other you receive a package from. Then on the last day of the month you publish a blog post describing the contents of the box you received. Good times, right? For a detailed description of the program, or to sign up, just click on the icon above. Both of the people I was paired up with this month hail from Toronto. I sent a package to Katie, a teacher working her way toward an MA in Education (whoa! ), and I received a package from Allie. Allie is a woman of many talents! She authors the The Crooked Apartment, an eclectic blog full of her reflections on daily life, music recommendations, and recipe and decor inspiration. She’s an avid runner and writes about that topic as well. It’s always an interesting read, so be sure to check it out! Allie is also amazing designer and has her own line of eco-concious wedding dresses. If you’re in the market for a truly elegant gown – or if you simply enjoy ogling beautiful clothes, like I do – head on over to the Little White Dress website and check out her lovely creations. One of the Foodie Penpal requirements is that you included something handwritten in your package, and Allie penned me this sweet note to put in mine. It gives a little information on each of the items she sent as well as recommendations for other foods she likes and thought I’d also enjoy, like Yoso coconut yogurt and Silk dark chocolate almond milk. I’m keeping an eye out for these for sure! 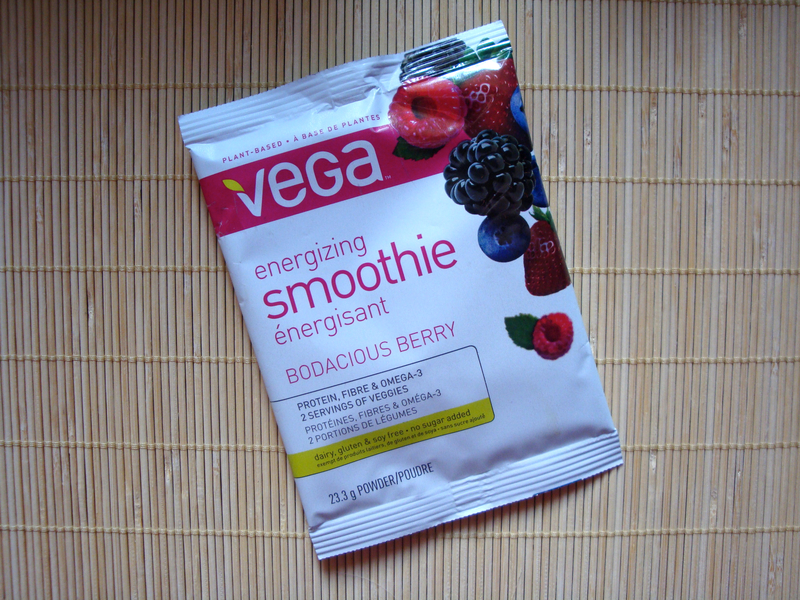 I love Vega products as they’re vegan and don’t contain the same creepy ingredients as other brands. I’ve never tried this flavour of smoothie but I’m down with anything containing berries so I’m sure I’ll like it. 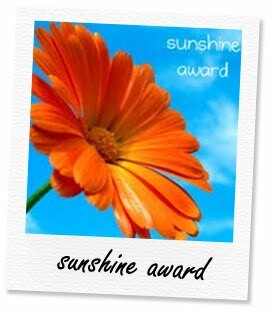 I’m hanging on to this until I’m in need of a serious pick-me-up! 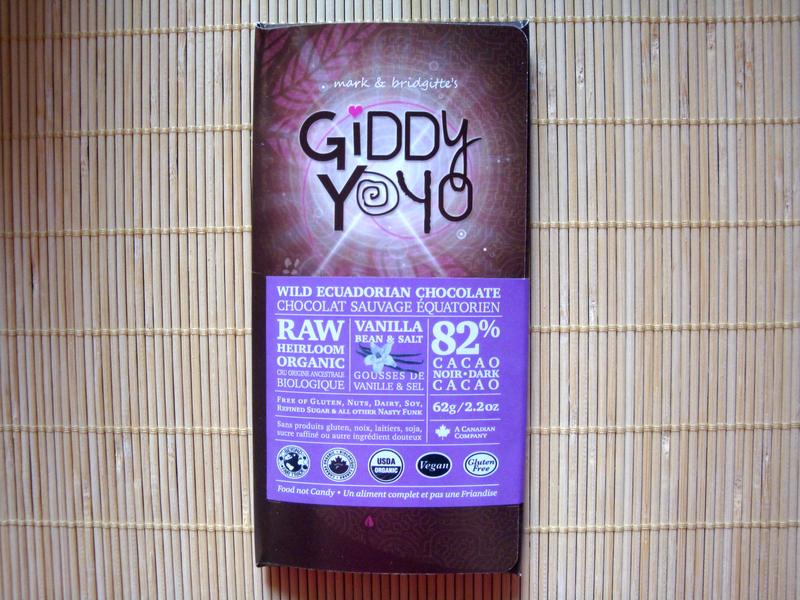 I’m passionate about dark chocolate, and this Giddy Yo Yo bar is the real deal. The chocolate was rich and silky with just a hint of vanilla and sea salt. Mind-bogglingly good! I definitely want to try out some of their other flavours. Good call on this one, Allie! 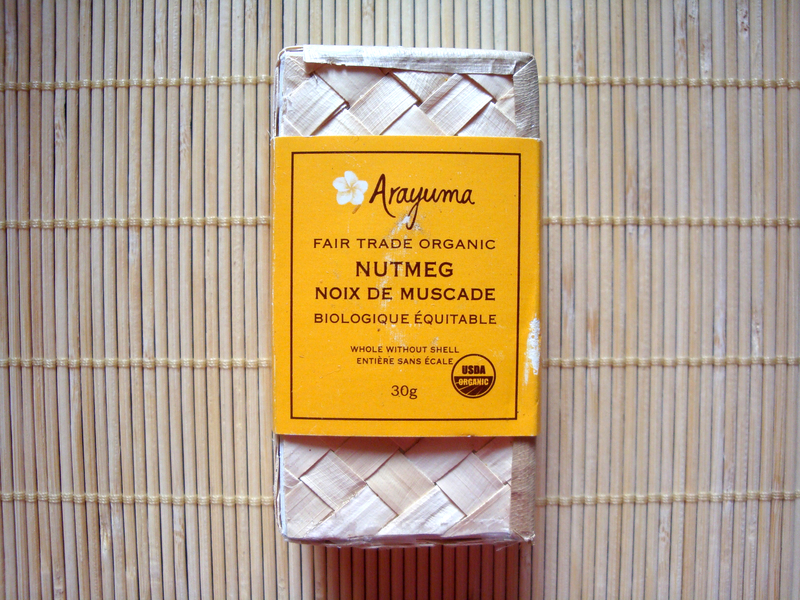 I use nutmeg frequently in my cooking and baking but usually buy the pre-ground stuff. I’m sure these whole nutmeg pods taste far more fresh and flavourful. I can’t wait to try them! Cute packaging, too. I also received these two tasty snacks. 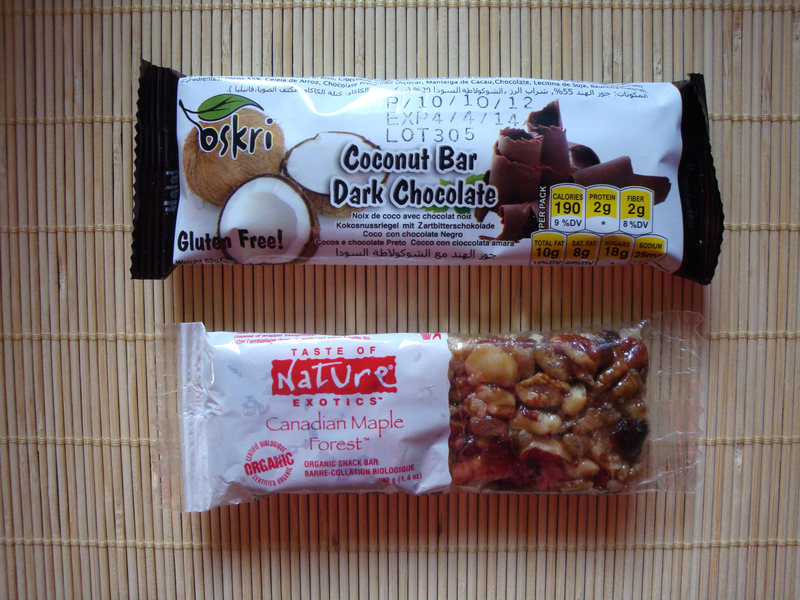 The Oskri Dark Chocolate Coconut Bar – basically a healthier version of a Mounds bar – has a pleasantly sweet, shredded coconut centre wrapped in a rich dark chocolate coating. I ate it for dessert the other night and loved every bite. The Canadian Maple Forest Bar was also delicious… dried fruit, nuts and brown rice crisps all held together with maple syrup and agave nectar. YUM! Aren’t these cute? 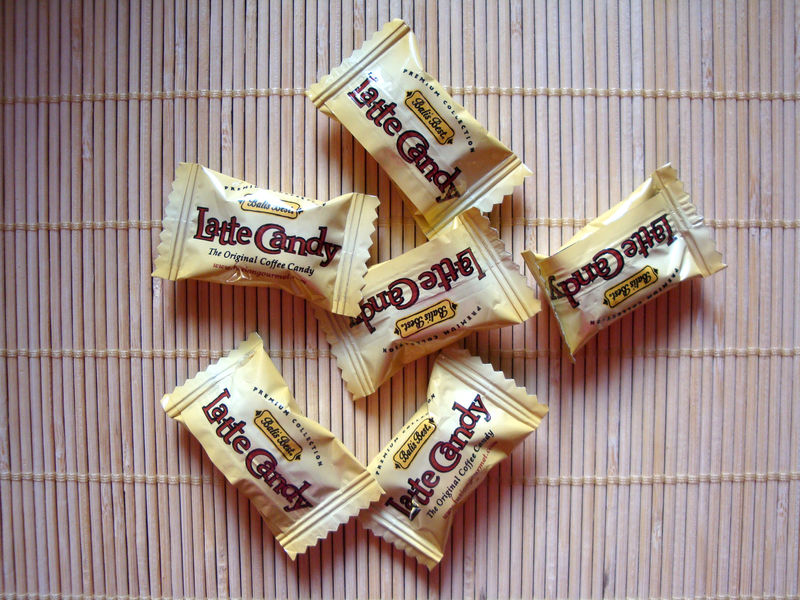 Like dark chocolate I’m also passionate about coffee (and anything coffee flavoured), and obviously these latte candies fit the bill. I put these in my purse to stave off cravings in the event that I can’t get to a coffee shop when the urge strikes. 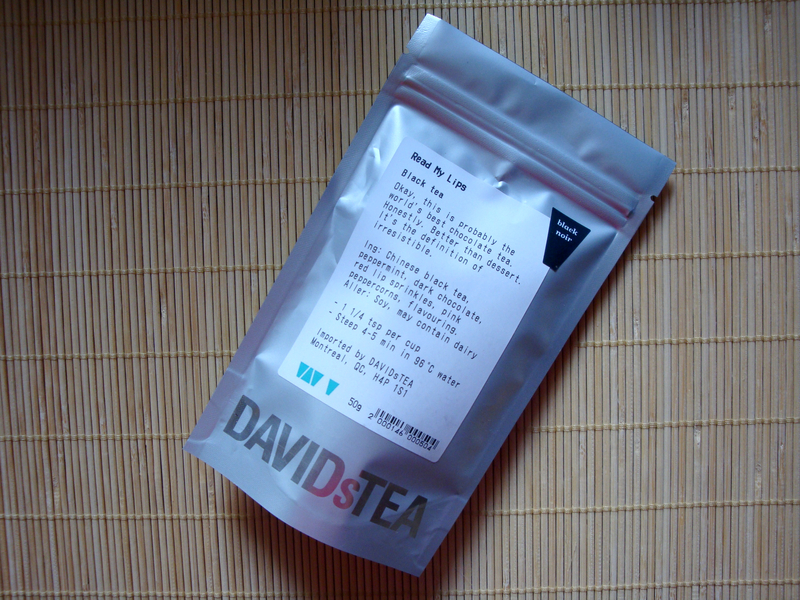 And now for the grand finale … a package of loose leaf tea from David’s Tea! The flavour is called ‘Read My Lips’ and it tastes like chocolate and mint! Typically I stick to traditional tea flavours so my taste buds were pretty much blown away by this tea. 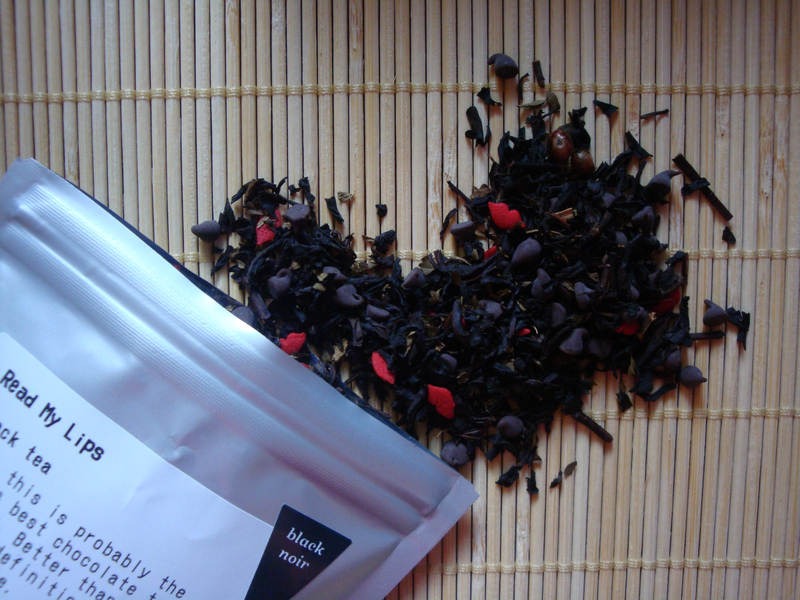 Now take a closer look… Amongst the black tea leaves are red lip sprinkles and mini chocolate chips! When hot water is poured over the tea the sprinkles and chocolate chips melt and impart the tea with a delicious chocolate and mint flavour! It smells fantastic and tastes even better. 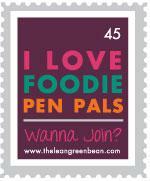 To find out more about Foodie Pen Pals, or to sign up, visit the Lean Green Bean blog here. Our new house is proving to be the gift that gives on giving in the faulty appliance department. It started with the archaic beast of a cathode ray tube TV we dragged in from the shed when we first moved in; our initial plan was to put this relic to use until we could retrieve our flat screen from the storage locker. Evidently the years it spent mouldering out back proved to be too much for this already obsolete goggle box, for upon plugging it into the wall it began scrolling itself (!?) through various static-y channels before going completely dark, presumably forever. As we aren’t avid enough fans of TV to attempt to trouble shoot and repair such an ancient piece of technology, the next day it was dispatched to the local waste disposal station along with the teal wall-to-wall carpet ripped up from the bedroom floor. I won’t reiterate the problems we were having with our screwy toilet and besides, a toilet doesn’t really count as an appliance. 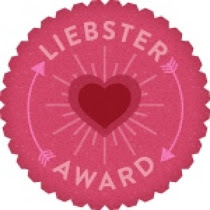 I will mention briefly that those issues seemed to have resolved themselves, something which has had a surprisingly significant impact on my personal quality of life index; being able to flush and be done with the matter is pretty awesome! The next piece of appliance drama came in the form of a humongous ball of fluff – possibly years worth (seriously, I could have made a throw pillow out of it ) – extracted from the lint trap in the dryer. That’s it. The real drama played itself out in my brain, where the fluff ball caught ablaze and burned the whole house down while we slept. Morbid thoughts! My inner neurotic always has a field day with potential hazards. The most recent appliance debacle occurred just a couple days ago and nearly toppled my plans to make this moreish pasta dish. In the midst of reheating some food in the oven I noticed a few wisps of smoke rising from behind the stove. This wasn’t merely ‘burning food’ smoke (which would have freaked me out enough), but the far more menacing, hot and plastically, ‘electrical component failure’ variety. I switched off the oven and started panicking a little – not like the time flames leapt into the air when I threw a bunch of kale into a skillet containing overheated olive oil, that was out-and-out hysterics – but panicking enough. Mike (an electrician by trade, hallelujah) was summoned from the front lawn and was able to quickly ID the problem (something with one of the connections in the wiring) and fix it – and in so doing put an end to sinister thoughts of preparing this dish in the microwave. What is your favourite way to cook asparagus? I’m always looking for new ideas! 1. Place cashews in a small bowl and cover with water. Let soak for an hour. Drain and rinse. 2. Place soaked cashews and vegetable broth in a blender or food processor. Blend for two minutes or until cashews and broth form a smooth liquid. Set aside. 3. Fill a medium skillet with cold water and bring to a gentle boil. Add asparagus and reduce to a simmer. Let asparagus cook just until bright green and tender crisp (this should only take a minute or two). Immediately drain asparagus and transfer to a bowl of ice water (this will ensure asparagus doesn’t over cook). 4. 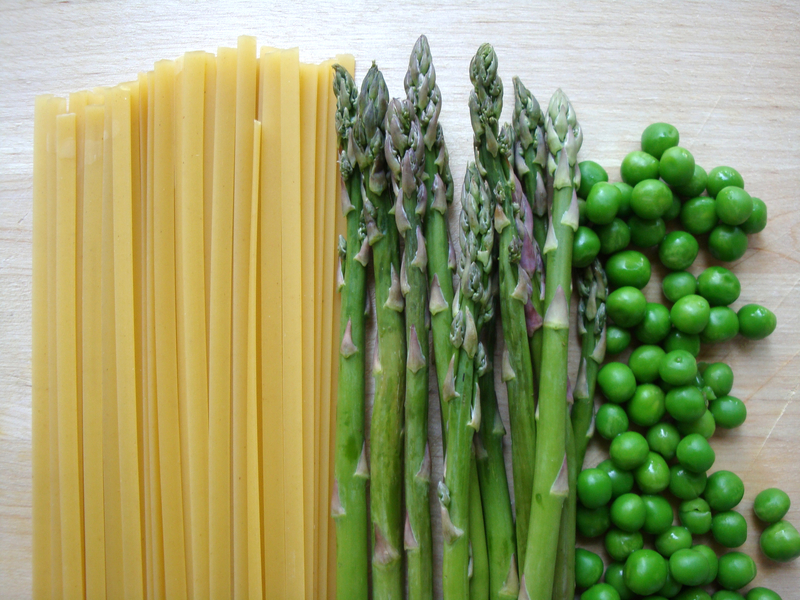 Once asparagus is cold, remove from water and cut into 1″ pieces. Set aside until needed. 5. Cook fettuccine according to package instructions, or until al dente. Drain and rinse. Set aside until needed. 6. Heat 2 tablespoons of olive oil in a large skillet over medium heat. Add garlic and red pepper flakes and saute just until garlic is golden brown. 7. Reduce heat slightly. Sprinkle flour into skillet and whisk continuously until a smooth paste forms. 8. Slowly pour cashew and broth mixture into skillet, whisking continuously until everything is incorporated and a smooth, creamy sauce forms. 9. Stir in wine and lemon zest. Taste sauce and season to taste with salt and pepper. 10. 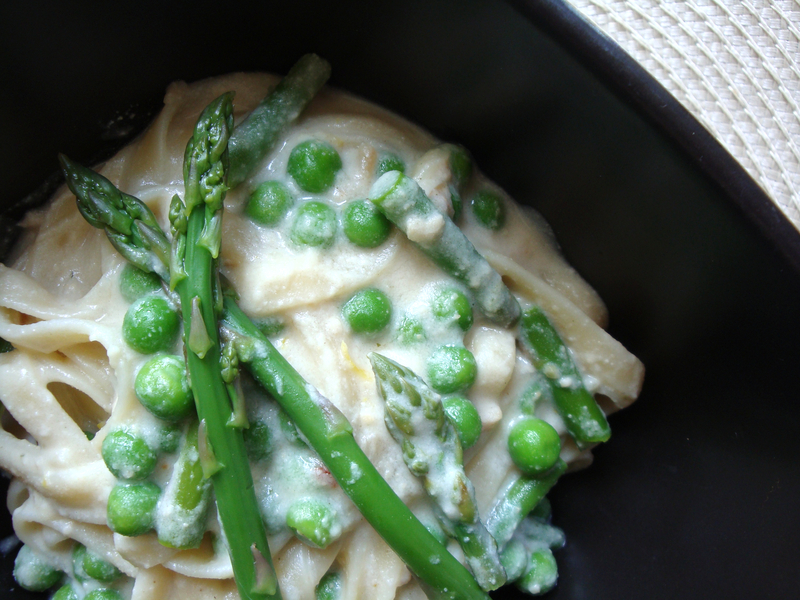 Fold in pasta, peas and asparagus. 11. Serve immediately, topping each portion with freshly ground black pepper. Eat! HELLO and welcome to GRVK! I started this blog when I was living in an RV - that's correct, a recreational vehicle (whom we named the Gypsy Roller) - with my boyfriend and our son. We now live in a 'normal' house - in the Fraser Valley region of beautiful British Columbia - and it's here where I create the tastiest of mostly vegan recipes for this blog. If you like what you see, please click the 'follow' button below! You can also find me on Twitter, Facebook and Pinterest. When I'm not cooking I enjoy reading, listening to the CBC, thrift store shopping, reminiscing about the 1980s, drinking coffee and dancing with my toddler son. © Hannah F (Gypsyroller77) and Gypsy Roller's Veggie Kitchen, 2012. Unauthorized use and/or duplication of this material without express and written permission from this blog’s author and/or owner is strictly prohibited. 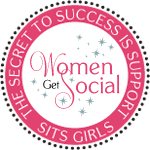 Excerpts and links may be used, provided that full and clear credit is given to Hannah F (Gypsyroller77) and Gypsy Roller's Veggie Kitchen with appropriate and specific direction to the original content.